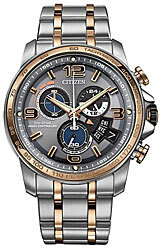 The Citizen Chrono Time A-T series features all the latest advances in Citizen's impressive Eco-Drive technology. The Chrono Time A-T is a second generation atomic timekeeping Chronograph Watch with atomic clock synchronization for superior accuracy, with the time pre-programmed for 26 cities (time zones) around the world. Model BY0106-55H has a two-tone stainless steel and rose gold case and bracelet with grey dial. This model also features UTC Time (ideal for pilots), an analog alarm, 1/5-second chronograph, perpetual calendar, a power reserve meter, sapphire crystal and date plus Citizen's amazing battery free solar technology. You never need a battery!